the one thing my parents were always at pains to avoid, and to their great credit, i cannot recall them having imposed it upon others, was the dreaded invitation to view an endless stream of photographs from a recent holiday enjoyed by all other than those condemned to look at the photos. it seems that in the halcyon days of yore, it was customary to plan a small evening soirée for a few intimate friends, usually accompanied by a buffet of compact and bijou proportions and the inevitable cheese and wine. the first thing those endeared of such conspiratorial excesses would do on returning from a holiday abroad, was to pop half a dozen spools of film (remember those) into boots the chemist and only a week or so later the inevitable phone call would be made. my late father was generally of fairly quick wit with sufficient experience of thinking on his feet to proffer a perfectly plausible excuse as to why he and my mother were indisposed that evening and how sorry they were to be missing it. if such things still exist it's very unlikely that they have retained a similar format. pretty much any contemporary computer features software that will not only display a slideshow of images when hooked up to a television set, but most likely be accompanied by a soundtrack culled from the benefactor's itunes library. as if this were insufficient to offer a teeth grinding evening, there's always the likelihood that you'll be presented with a dvd of the images on your way out at the end of the night. however, a colleague and i were discussing only the other day (shortly after he himself had returned from a european holiday) that despite the impressive number of images that can be contained on a tiny microchip inserted into the nether regions of the camera, quite some number of those were, to all intents and purposes, redundant within only a matter of days. his contention was that from a personal point of view, only a salient few need be viewed to bring back all the relevant memories of the trip. thus the hundreds, if not thousands of photographs populating the library of computer software were effectively unnecessary. simple association with key images was really all that was needed. in this respect, association is a key pointer. certain bicycles within thewashingmachinepost bikeshed are associated with specific terrain and/or weather conditions. the cielo, for instance, has been patiently waiting at the back of the building for long enough. though its full wood fenders may possibly have seen sterling duty over the poor excuse for a summer experienced this far west, it seemed a tad defeatist to make use of their protection at this time of year. clothing too has its place and associations. the small collection of winter caps that have occupied the same space in the cycling wardrobe since last winter are probably soon to be brought once more into service. that means, in no specific order, cold, wet and windy, while i can already hear incessant rustling in the spare room as the softshells, hardshells and waterproofs realise their time has almost come. but such associations are not entirely dependant on function; the brand name embroidered on the left breast of a jersey often brings connotations that were perhaps implicit during the original naming process. yanto barker's le col for instance. it's a name that invokes alpine vistas of snow topped mountains, hibernating ski-resorts and all but unscaleable passes. as this is the inner hebrides, we are sadly bereft of such challenges, but the name le col still demands that such a brand be at least periodically subjected to ascents, however paltry they may be. it is not so long since i mentioned the rather steep, if relatively short climb at ardnahoe on the island's northern reaches. with one or two brief hints of 20%, it's probably the closest to the alps islay can offer (no sniggering at the back, please). i'm sure you can see that i had little option other than to scale its summit dressed in a striking navy blue, short sleeved jersey with the words le col embroidered on the front. 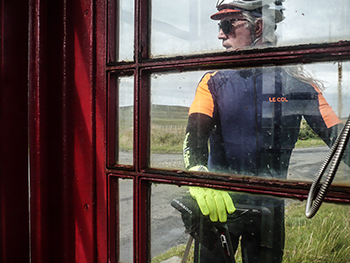 though i prefer to use the descriptor ascending, i fear the reality was far closer to grovelling, but one of the great benefits of le col's hc jersey is the ability to present the wearer as a stalwart of his profession, no matter the physical disintegration experienced on the way up. and the similarly coloured embroidered logo below the collar marks one out as a member of the cognoscenti. 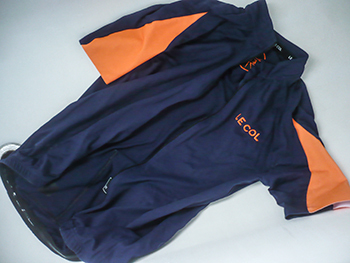 why else would one be dressed in le col clothing? the fascination, for me at least, was part and parcel of those orange segments on the sleeves. constructed from a material referred to as gummy lycra shield, the inside presents a substantial grid of tiny gloopy dots that even over a merino baselayer, prevent the sleeves scrolling upwards. it does make the jersey a tad trickier to put on in the first place, but i can't deny it was fun trying. 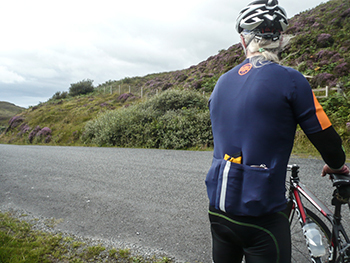 the three rear pockets cheerfully swallowed an essentials case with compact digital camera and coffee money, a foldaway waterproof jacket, a scrunched up musette, a mini-pump and a spare pair of cycling mitts (you can never be too careful nowadays). yet in so doing, the jersey's substantial constitution kept the sartorial police at bay. though i am still one of only two people in the world who does not possess a mobile phone, smart or otherwise, according to le col, the 4th zipped security pocket is ideally sized to accept even an iphone 6.
though the fabric feels slightly heavier than expected, the full-length zip allows for adequate and adjustable ventilation, while the garment's breathability was more than good enough not to be noticeable in the heat of battle (grovelling up hills mostly). the price tag of £150 does seem to be heading towards the ever so slightly excessive, but in truth, this is one of those jerseys that should not only look every bit as good in five years' time, but its peerless construction ought to ensure that it still functions every bit as well as it did when removed from the packaging. since all le col jerseys are italian made, it makes sense to check the size charts carefully before ordering, as they tend to err slightly on the small side. 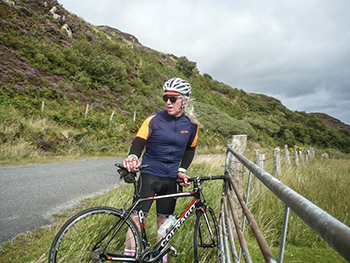 yanto barker has worked hard to produce a cycle clothing range offering a quality and fit that is every bit the equal if not surpassing that of many competing brands. his efforts quite plainly have not been in vain. 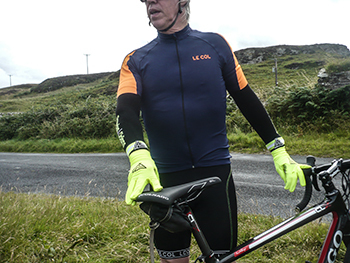 the le col hc range of jerseys retails at £150 each and is available in sizes ranging from small to xl and in colours navy/orange (as reviewed), verde/black, red/black, fluoro yellow/navy, ticker tape and blue/black.